Handel: Violin Sonata in G minor, HWV364b. This recording comes with several health warnings, not least the fact that none of the five featured Sonatas are quite what they seem. The three Bach sonatas were, as the CD title implies, intended for the viola da gamba. The Scarlatti Sonata was probably intended for solo harpsichord although there is an argument that it, and some of its fellow sonatas, could have been performed as a violin sonata. The Handel Sonata was originally for oboe but was transcribed for the violin with a scribbled note that it could be played on the viola da gamba. None were intended for the cello. Apart from the fuller and harmonically richer sound of the cello, the different ways of holding the bow (cello overhand, gamba underhand) means that the initial attack of notes is very different, with the viola having gentler, more subtle initial transient, the cello having a more forceful attack. Intonation on the gamba is achieved by frets on the fingerboard, while the cello does not have those aids, meaning that it was possible to slide the finger along the fingerboard to produce portamento – although in Bach’s was rarely, if ever, used. As well as the choice of instrument, another issue is the balance between the cello and harpsichord. The Bach Sonatas are in Trio form, implying an equal balance between all three voices, two of which are played on the harpsichord. But on this recording, the harpsichord sounds remote, both spatially and aurally, making them sound more like cello solos with a harpsichord accompaniment rather than true Trio Sonatas. The chosen balance is, perhaps, slightly more appropriate in the Scarlatti and Handel Sonatas, which are solo pieces with continuo. The harpsichord has just a single line of music upon which to improvise his accompaniment – here reinforced with continuo cello played by Robin Michael. 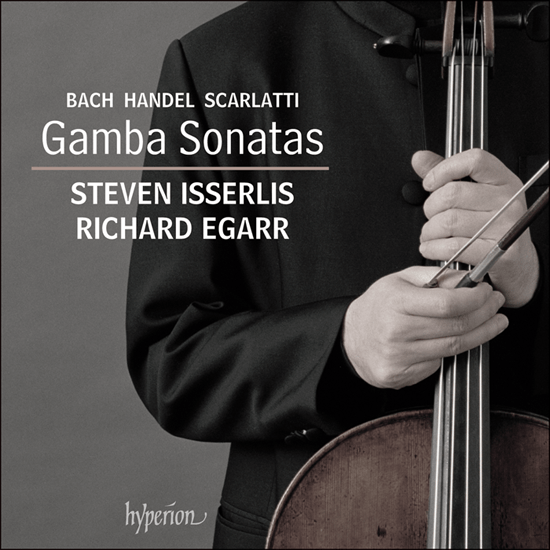 Richard Egarr’s occasionally adventurous, but usually appropriate harpsichord continuo realisations are one of the highlights of this CD, so it is a shame that they are so hard to hear over the sound of the cello. That said, if you are a cello and Steven Isserlis fan, and probably like to sit in the very front row of his concerts, but are not to keen on the sound of the harpsichord, you will love it. Both players have an individual and rather rhetorical approach to interpretation and are not afraid of making subtle changes to the pulse and timing of individual notes. But both generally stop just short of moving into an inappropriate later romantic interpretation, although Steven Isserlis’s use of vibrato and portamento is perhaps not entirely period PC.